3. Department of Health Statistics, Second Military Medical University, Shanghai, China. Objective: This study was to determine the reliability of age-stratified diagnostic index in differential diagnosis of malignant and benign solitary lesions in the liver using fluorine-18 fluorodeoxyglucose positron emission tomography/computed tomography (18FDG PET/CT). Methods: The enrolled 272 patients with solitary lesions in the liver were divided into three age groups, younger group (under 50 years), middle-aged group (50-69 years), and elderly group (70 years and above). Patients' ages were compared, and the optimal cut-offs of the standard uptake value (SUV) ratio (tumor-to-non-tumor ratio of the SUV), as well as areas under the curves (AUC), were evaluated in terms of malignant and benign lesions in each age group by using receiver operating characteristic (ROC) analysis. Based on optimal cut-offs, the sensitivity, specificity, accuracy were calculated, and the diagnostic accordance rate was compared between each age group and all patients, supported by 18FDG PET/CT imaging data. Results: There was a significant age difference between the malignant and benign groups (t=3.905 p=0.0001). ROC analysis showed that the optimal cut-off value in all patients, younger group, middle-aged group and elderly group was 1.25, 1.17, 1.45 and 1.25 for SUVratio, and 0.856, 0.962, 0.650, 0.973 for AUC. The chi-square test proved that diagnostic accordance rate of 18FDG PET/CT in younger group and elderly group were superior to that in all patients (χ2=13.352, P=0.0003) and (χ2=8.494, P=0.0036). Conversely, overall diagnostic accordance rate in all patient group was higher than that in middle-aged group (χ2=9.057, P=0.0026). Representative 18FDG PET/CT imaging findings are demonstrated. Conclusion: This study indicates that diagnostic optimal cut-offs of SUVratio of liver solitary lesions of 18FDG PET/CT were different in each age group. In addition, the diagnostic performance of SUVratio was better in younger and elderly groups than that in all patients, and was poorer in middle-aged group than that in all patients. Therefore, age difference appears to be one of the important factors for discriminating malignant liver lesions from benign ones using 18 FDG PET/CT. Keywords: Positron emission tomography/computed tomography (PET/CT), Standardized up take value (SUV), Solitary hepatic lesion, Age-related. Discrimination between a benign tumor and a malignant one in the liver is an essential clinical problem. The most commonly found benign tumors in the liver are cysts, cavernous hemangioma, focal nodular hyperplasia, adenoma, fatty infiltration and regenerative nodules, followed by less common lesions such as liver abscess and angiomyolipoma. In terms of liver malignancies, metastases from various primary lesions to the liver occur 20 times more often than primary hepatocellular carcinomas (HCCs) and are often multifocal. Although many tumors may metastasize to the liver, the most common primary malignant tumors producing liver metastases are colorectal, gastric, pancreatic, lung and breast carcinomas, and 90% of them as well as HCCs and cholangiocarcinoma originate from epithelial cells. One viable imaging modality applied for differential diagnosis liver tumors is fluorine-18 fluorodeoxyglucose (18FDG)-positron emission tomography/computed tomography (PET/CT). There are three patterns of 18FDG uptake among HCCs, i.e. 18FDG uptake higher, equal to, or lower than background liver 18FDG uptake in 55%, 30%, and 15% of the patients respectively. All benign tumors including focal nodular hyperplasia, adenoma, and regenerative nodules, demonstrate 18FDG uptake at the same level as that in normal liver, except for null uptake in hepatic cyst and high uptake in rare abscess with granulomatous inflammation [1-3]. Studies have shown the usefulness of 18FDG-PET for liver lesion characterization, assessment of therapeutic responses and prediction of outcomes [4, 5] with sensitivity greater than 90% for malignant primary hepatic neoplasms and all metastatic liver tumors . Whereas, other reports showed that the sensitivity of 18FDG-PET was only 50-55% in patients with HCCs, primarily because of their high rate of gluconeogenesis comparable to that of normal liver tissue, resulting in a similar uptake of 18FDG [6-8]. On the other hand, normal liver shows high intrahepatic activity of glucose-6-phosphatase enzyme that dephosphorylates FDG-6-P, decreases its intracellular trapping, and lowers radiotracer accumulation. By contrast, some low- and intermediate-grade or well differentiated HCCs do not retain this feature, resulting in intense 18FDG activity retention in cancer lesions as compared with healthy liver tissue. Furthermore, this enzymatic activity is impaired in high-grade or poorly differentiated HCCs, and usually such lesions can be detected as hypermetabolic spots on 18FDG PET/CT. In China, 20-30% of 1.3 billion people are hepatitis B virus (HBV) carriers, constituting the largest such population in the world [4, 5]. The number of liver cirrhosis and newly diagnosed HCC patients in China accounts for about 50% of the total annual cases worldwide [4, 5]. Thus, accurate diagnosis is mandatory in therapeutic decision making for individual patients. To our knowledge, there have been no studies reporting the use of 18FDG-PET/CT to discriminate between benign and malignant solitary liver lesions on the basis of the standard uptake value (SUV) optimal cut-off value according to age distribution of patients. In this study, we assessed various cut-off values and diagnostic performance of 18FDG-PET/CT to differentiate between benign and malignant solitary liver lesions in different age groups. Such results might be useful for physicians to more accurately estimate the probability of benign or malignant nature for a solitary liver lesion, and to decide whether further investigation is needed preoperatively to rule out the possibility of a benign lesion. In this retrospective study, subsequent patients from January 2008 to June 2013 were entered into a database and were eligible for this analysis if they underwent a whole-body 18FDG PET/CT examination for work-up of a single lesion on the liver. The study population consisted of 272 patients (69 women and 203 men) with an age range of 30-84 years. They were divided into three age groups, younger patients (under 50 years), middle-aged patients (50-69 years) and elderly patients (70 years and above) . Their final diagnoses were proven by histopathological examination. Patients without histopathological proof of a benign lesion underwent imaging and clinical follow-up for at least 2 years after PET/CT. As analysis in this study was merely retrospective, neither Institutional Review Board approval nor informed consent was required by the national law in China. 18FDG-PET/CT scans were obtained with an advanced PET/CT scanner (Discover LS; General Electric Medical Systems, Lititz, Pennsylvania, USA). All patients were instructed to fast for at least 6 hours before examination and the plasma glucose concentration was measured before injection of the tracer. The blood glucose level was less than 140 mg/dl in all patients. No patient underwent urinary bladder catheterization or received any oral muscle relaxant. No CT contrast agent was administered. PET images were acquired approximately 1 hour after injection of 0.15-0.20 mCi/kg 18FDG on a 2D mode. Subsequently, each patient underwent whole-body scanning for cranial CT: 140 kV, 160 mA; for body CT: 140 kV, 200 mA; a slice thickness of 4.25 mm; and a rotational speed of 0.8 s/rotation (helical thickness 5.0 mm)] from the base of the skull to the mid-thigh. The emission scan time per bed position was 5 min and 5-7 bed positions were acquired. Both PET and CT scans were obtained during normal tidal breathing. The PET images were reconstructed with CT-derived attenuation correction using ordered-subset expectation maximization software. The reconstructed CT images were displayed using a matrix of 512×512 pixels by standard reconstruction method. The attenuation-corrected PET, CT and fused PET/CT images were available for review in axial, coronal, and sagittal planes, using the manufacturer's review station (Xeleris; GE healthcare, Pennsylvania, USA). The SUV, defined as the ratio of activity in tissue per milliliter to activity at the injected dose per patient body weight, has been proposed as a simple useful semiquantitative index for FDG accumulation in the tissue. 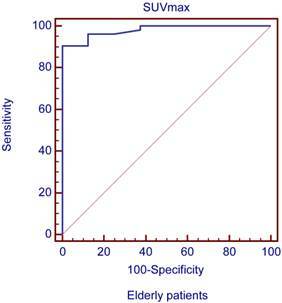 Maximal standard uptake value (SUVmax) of the tumor was measured using 18FDG PET/CT, i.e. SUVmax =maximum activity concentration in region of interest (ROI) (MBq/kg)/injected dose (MBq)/body weight (kg). For quantitative evaluation, a ROI was placed over the entire tumor region, at the level of the maximum diameter of the tumor. A background ROI was then placed over the non-tumor region of the liver. tumor-to-non-tumor ratio of the SUV (SUV ratio)= maximal SUV of tumors/average SUV of the non-tumor region. Interpretations of PET images were performed by consensus of at least two nuclear medicine physicians, with all clinical information available, including anatomical information provided by CT. Different SUV ratio optimal cut-off values in the differentiation of malignant and benign solitary liver lesions of the three age groups were analyzed. Variables that follow normal distribution were described as mean±SD and compared between the malignant and the benign using Satterthwaite t-test. 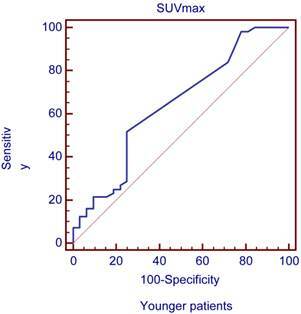 Receiver operating characteristic (ROC) curves and AUC were used to evaluate the diagnostic performance of SUVmax for each age group and the optimal cut-off values in terms of their abilities to discriminate between malignant and benign lesions. In addition, the diagnostic accordance rate was compared between patients in each age group and all patients using chi-square test. 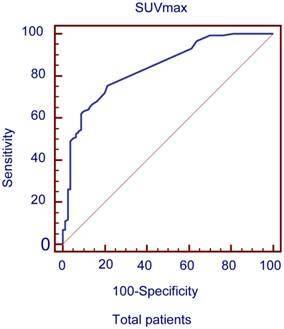 The patients were then grouped according to these cut-off values to calculate sensitivity, specificity and accuracy. ROC analysis was executed using MedCalc version 11.6.0 (MedCalc Software, Mariakerke, Belgium). Other calculations were performed using SPSS 17.0 (SPSS, Chicago, Ill.). All the p values were derived from two-sided test, and p value < 0.05 was considered statistical significance. The patient characteristics are listed in Table 1. There were 88 (32.35%) patients in the younger group, 109 (40.07%) patients in the middle-aged group, and 75 (27.57%) patients in the elderly group. The mean age was 59±12.12 years in the malignant group, and 52.5±13.4 years in the benign group. There was a significant age difference between the malignant and benign groups (t=3.905, p=0.0001). Based on our data of the all patient groups, patients with malignancies consisted of 70.22% of (190/272) the population including 47.79% with HCC (130/272), 7.72% with cholangiocarcinomas (21/272), 13.34% with metastasis (39/272), and 0.37% with sarcoma (1/272); and the rest 29.78% were patients with benign tumors (81/272). The number of patients and types of solitary liver lesions in each group are summarized in Table 2 where we could notice that patients with HCC occupied the largest proportion of the younger and middle-aged groups, whereas patients with liver metastases dominated in the elderly group. *: Variances are unequal between two groups. Using Satterthwaite t-test. Percentage and number of patients of every type of solitary liver lesion in each group. The ROC curves and AUC of SUV ratio in all patients were plotted to predict solitary liver lesions in Figure 1. ROC analysis showed that the optimal cut-off value in all patients was 1.25 for SUV ratio and 0.856 for AUC. The diagnostic performances of SUV ratio by 18FDG PET/CT in solitary liver lesions in each age group are compared in Table 3. ROC curves plotted for differentiation between benign and malignant liver lesions of the liver based on SUVmax in total patient groups. Diagnostic performance of 18FDG PET/CT in solitary liver lesions in each age group. The ROC curves and AUC of SUV ratio in younger group are shown in Figure 2. ROC analysis showed that the optimal cut-off value in these patients was 1.17 for SUV ratio and 0.962 for AUC. The younger patients group showed the highest sensitivity and specificity, followed by the older group, and the middle-aged group. Typical 18FDG-PET/CT imaging examples of benign and malignant solitary liver lesions in this group are displayed in Figure 3 and 4. Figure 3 showed a female patient with liver cyst where the SUV ratio was 0.3, and Figure 4 showed a male patient with HCC of which the SUV ratio was 2.1. The ROC curves and AUC of SUV ratio in middle-aged group are shown in Figure 5. ROC analysis showed that the optimal cut-off value in all patients was 1.45 for SUV ratio and 0.650 for AUC. The middle-aged group revealed the lowest sensitivity and specificity. Typical 18FDG-PET/CT imaging examples of benign and malignant solitary liver lesions in this group are displayed in Figure 6 and 7. In Figure 6 from a female patient with liver abscess, the SUV ratio was 4.1, which was much higher than the optimal cut-off value. On the other hand, in figure 7 from a male patient with HCC, the SUV ratio was only 0.98. The ROC curves and AUC of SUV ratio in elderly group are presented in Figure 8. ROC analysis showed that the optimal cut-off value in these patients was 1.25 for SUV ratio and 0.973 for AUC. The elderly group yielded relatively high sensitivity and specificity. Typical 18FDG-PET/CT imaging examples from a patient with benign and malignant solitary liver lesions in this group are demonstrated in Figure 9 and 10, respectively. SUV ratio was able to help identify malignant lesions with a higher sensitivity, specificity and accuracy in younger and elderly patient groups compared with all patients and middle-aged group. Chi-square test showed statistically significant differences in the diagnostic accordance rate between the younger patient group vs. all patient group (χ2=13.352, P=0.0003) and elderly patient group vs. all patient group (χ2=8.494, P=0.0036). The Chi-square test also indicated that the diagnostic accordance rate in total patients was superior to that in middle-aged patient group (χ2=9.057, P=0.0026). ROC curves plotted for differentiation between benign and malignant lesions of the liver based on SUVmax in younger patient group. Figure 2 ROC curves plotted for differentiation between benign and malignant lesions of the liver based on SUVmax in younger patient group. A 47-year-old woman with a liver cyst. A: Axial non-contrast CT-scan showed a cyst-like lesion with low density in right lobe (cross); B: 18FDG PET image showed low-uptake in the cyst (SUVratio=0.3); C: Axial PET/CT fusion image with cross. A 45-year-old man with a hepatocellular carcinoma (HCC) which was proved by liver biopsy. A: Axial non-contrast CT-scan showed a low density lesion in left lobe (cross); B: 18FDG PET image showed high uptake in the lesion than liver background (SUVratio=2.1); C: Axial 18FDG PET/CT fusion image with cross. ROC curves plotted for differentiation between benign and malignant lesions of the liver based on SUVmax in middle-aged patient group. A 51-year-old woman with liver abscess which was proved by liver biopsy. A: Axial non-contrast CT-scan showed a low density lesion in right lobe; B: 18FDG PET image showed high ring uptake in the lesion than liver background (SUVratio=4.1); C: Axial 18FDG PET/CT fusion image. A 53-year-old man with HCC which was proved by liver biopsy. A: Axial non-contrast CT-scan showed a low density lesion in right lobe (cross). B: 18FDG PET image showed almost the same uptake in the lesion (SUVratio=0.98) relative to the liver; C: Axial 18FDG PET/CT fusion image with cross. A: 71-year-old man with a liver metastasis of colon cancer which was proved by liver resection. A: Axial non-contrast CT-scan showed a low density lesion in left lobe (cross); B: 18FDG PET image showed higher uptake in the lesion compared to liver background (SUVratio=3.9); C: Axial 18FDG PET/CT fusion image with cross. A 73-year-old man with a cholangiocarcinoma which was proved by liver biopsy. A: Axial non-contrast CT-scan showed a low density lesion in left lobe; B: 18FDG PET image showed higher uptake in the lesion compared to liver background (SUVratio=5.6); C: Axial 18FDG PET/CT fusion image. Solitary hepatic lesions can be of benign, malignant, and infectious natures. Differentiation between various intrahepatic pathologies by imaging criteria can sometimes be difficult, particularly in discrimination between benign and malignant/premalignant lesions that often have overlapping imaging characteristics. It is therefore important to know 1) how accurate 18FDG PET/CT imaging is in the diagnosis of patients with single hepatic lesions, 2) whether it has the different optimal diagnosis cut-off value in different age groups, and 3), in addition, whether age is an independent factor influencing the diagnostic performance of 18FDG PET/CT, as expected. Our study was based on the analysis of clinical data from 272 patients with solitary liver lesions in a single institution. According to age distribution of the patients, we found certain SUV ratio optimal cut-off values specific to each group. It should be noted that the physiologic liver uptake of FDG is quite variable and the SUV value can change depending on a series of variables such as the injected activity, the time elapsing from the dose injection to the acquisition time, and so on. Consequently we selected SUV ratio as a criterion. By using the optimal cut-off values, we sought to compare the diagnostic performance of 18FDG PET/CT in the evaluation of single hepatic lesions between each of the three groups and in all patients. While in some studies, the age groups were defined with different age cutoff values , we defined “young patient group” as ≤49 years old, “middle-aged patient group” as 50-69 years old, and “elderly patient group” as ≥70 years old, which allows for more meaningful comparisons with other studies. Based on our data regarding malignancies in the elderly versus middle-aged patient group, it is suggestive that elderly patient group may yield more metastases and cholangiocarcinomas than middle-aged patient group, and middle-aged patient group may have more HCC than elderly patient group. This may be partially the reason why the diagnosis of lesions was more reliable in elderly patients. A previous meta-analysis performed to compare noninvasive imaging methods (US, CT and MRI and 18FDG-PET) for the detection of hepatic metastases from colorectal, gastric, and esophageal cancers demonstrated that the sensitivity of 18FDG -PET was higher than that of MRI, CT and US (90% vs.76%, 72% and 55% respectively), given an equivalent specificity of 85% . To observe liver metastases, Kinkel et al reviewed a total of 111 studies including more than 3000 patients and found a specificity of at least 85%, and 90% weighted sensitivity for 18FDG PET. Recent studies concluded that 18 FDG PET/CT had a higher sensitivity (91-100%) and specificity (75-100%) than MSCT (68.0 and 67.4%) for detecting colorectal liver metastatic lesions [11-13]. Another study indicated that FDG uptake was increased markedly in all peripheral cholangiocarcinomas . On the other hand, there were similar disease distributions between the younger patient group and the middle-aged patient group (57.95% HCC vs 55.05% HCC). But the Chi-square test showed statistically significant differences in the diagnostic accordance rate between the two age groups. Compared with the middle-aged patient group, the younger patient group had different diagnostic SUV ratio cut-off value, which may be more easily to diagnose well-differentiated HCC lesions with similar uptake of FDG to normal liver tissue. Chun-Yi L et.al found a statistically significant and positive relationship between age and SUV of the liver . This indicates that older people may have higher physiological FDG uptake in the liver than younger adults. High physiological background FDG uptake may reduce diagnostic sensitivity and accuracy for detecting malignant lesions, and, in an aging population, may result in false negative findings in the liver on 18FDG PET imaging. The results of 18FDG PET/CT in our study are congruent with the previously published results in terms of that as there are different disease distributions and the different physiological changes of the liver in the each age group, different diagnostic indexes should be used in different age patients groups by 18FDG PET/CT. Obviously, our imaging study had several limitations including its retrospective nature with potential patients' selection bias, data from a single PET/CT centre, a relatively small sample capacity and a lack of clinical biochemistry analyses. Besides, histopathology was not available for most benign lesions detected with 18FDG PET/CT. Obtaining histopathological diagnosis in all patients would be desirable, but this was impossible for both practical and ethical reasons in particular cases. Nevertheless, our study underscores the need for further prospective study to identify specific factors placing patients at a higher risk for malignant solitary liver lesions, and to appropriately screen these patients in hopes of an earlier imaging diagnosis and better management options. 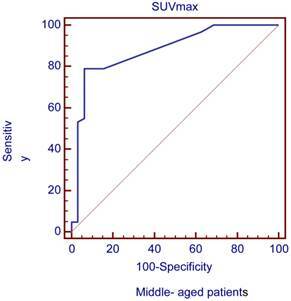 Our study demonstrated that diagnostic optimal cut-off values of SUVmax should be different in each age patient group for differential diagnosis of malignant and benign solitary lesions in the liver using 18FDG PET/CT. Therefore, age difference could be one of the important factors for discrimination between malignant and benign lesions in the liver in using 18 FDG PET/CT. This study was partially financed by Founding of Shanghai Municipal Health Bureau (2012170); China Scholarship Council (201204490179) and the Education and Training Department of the Flemish Government (1F2B8G/JDW/2013-2014/13-BLT-CHI-02). Yicheng Ni is currently a Bayer Lecture Chair holder. Corresponding authors: Prof. Yicheng Ni, MD, PhD. Department of Imaging and Pathology, University Hospitals, KU Leuven. Address: Herestraat 49, Leuven, Post code and country: 3000, Belgium. Tel: 0032-16-330165; Fax: 0032-16-343765 E-mail: yicheng.nikuleuven.be or Dr. Linjun Tong, MD. Department of Nuclear Medicine, Ren Ji Hospital, School of Medicine, Shanghai Jiao Tong University. Address: No.160, Pu Jian road, Shanghai. Post code and country: 200127 China. Tel: 0086 -21- 50892400 Fax: 0086-21-50890497 Email: tong1531com.